Hello to all our awesome foodologists; caterers, bakers, cakers, cafe owners and fountain rental folks! We are rolling out a red carpet for you – covered with new products and cool ideas to say “thanks for being our totally amazing customers”! Great Money Making Opportunities for the Creative Foodie! Over the next few months we will be blasting our Sephra Inner Circle Pros with tons of innovative ideas to reap the highest return on your dollar. Sephra Commercial is adding a bunch of fun new products. We’ve got some pretty innovative stuff on the horizon – so you can be more creative and 5 jumps ahead of your competition! Yay – More Money!!! Decorettes are sweet morsels of decorating candy to be used just about anywhere. 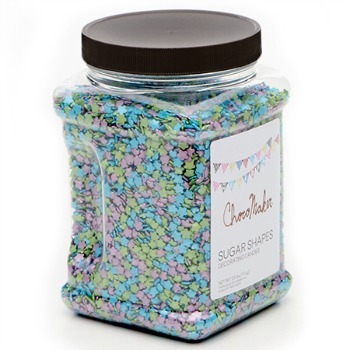 Dazzling sugar bits of all shapes and colors to top cookies, cakes, cupcakes, donuts, chocolate creations, ice cream, cheesecake, muffins, pancakes, waffles; the list is endless. Decorettes are just what their name implies…decorations! Little bits of sugary goodness to dress up all your culinary creations. We all know, we “eat” with our eyes and these little beauties invite you to take a big bite! We have had so much fun experimenting with them. Food creations we thought looked fabulous as they were, looked a million times better with these splashes of color! Decorettes make your food “pop”! We carry a pretty wide variety of Decorettes and they all take on subtle differences. 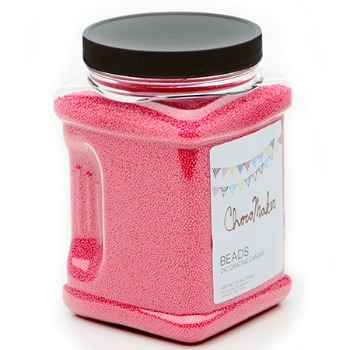 Everything from wispy shreds; shiny mini beads; multi-colored sprinkles, even baby marshmallow dots and little teeny circles and stars in every color of the rainbow. Beautiful petite sugary bits to top off your gorgeous presentations with even more elegance. 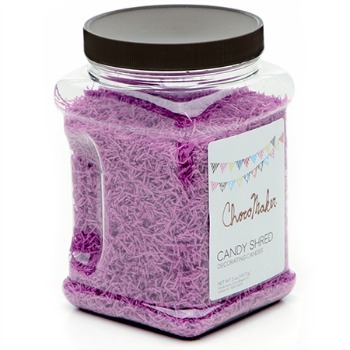 Candy Shred are bits of shredded candy that really add character to donuts, cupcakes, cookies, and basically everything! Use the green shred for grass – the colored shred for hair on cute animal characters! Shred is awesome and so affordable because its so light weight! Confetti are one one of my favs. I say “one of” because as you will see – there are so many cool shapes and colors. My brain is exploding with ideas as I write this. Anywho… confetti are little round flat disks which come in several colors. Check out the multi – color confetti. It’s a great place to start! Sugar Shapes (another fav) come in clever cute shapes and colors. Red and white hearts, green, blue and purple daisies, silver stars, multi-color butterflies, tiny bits of marshmallows… all cute colorful bursts of color and themes to accommodate any occasion. These are perfect for holiday confections – too stinkin’ cute! Shimmer Beads are teeny little beads of color pops. They are really delicate and come in a bunch of colors as well as multi color, too! Beautiful on cookies, donuts and cakes! 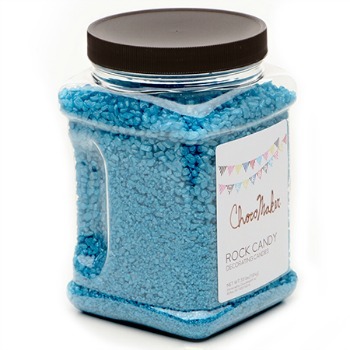 Shimmer Rock Candy – Gorgeous, shimmery mini rock candy in a miriad of colors from red, blue, green, purple, orange, yellow and white. There is even a multi-color option with red, blue and purple which looks amazing! We realize, your success helps our success, so we want to make things super affordable to use. 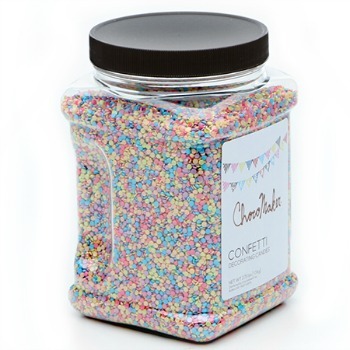 So instead of the smaller sized sprinkles and cake decorations you typically find at craft stores – smaller containers at prohibitive prices – we find it’s smarter to buy these in bulk! These jars are big. If you can’t tell from the picture – ever buy a jar of nuts from Costco? These are the same huge size jars! Compare the prices of our Decorettes to your most reasonable supplier and you’ll find them way below market and way above in cuteness! Sephra Commercial is really focusing on giving you more value for your dollar, allowing you to become more creative AND MAKE MORE MONEY! Let’s be honest, while we love what we do in the culinary field, it’s hard work. When we can gain an edge by making something prettier, more appealing and a notch above the competition, and then do so with a small $$$ investment, we’ve set our company apart from the ordinary. Yay for something creative, new and cool! We gain the reputation for ‘going the extra mile’ and the word spreads from customer to customer that we provide extra VALUE! That’s what everyone is looking for…more VALUE for their hard earned dollar. Giving top notch service, using only the best ingredients and providing a beautiful, elegant and unique product will take your company to the #1 spot in your field. Sephra Commercial provides you with the “best” and “unique” ingredients and products. 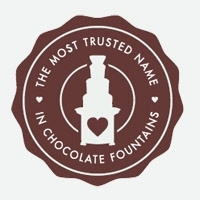 We already make the #1 chocolate fountains in the world. We’ve worked hard to provide the very BEST fondue chocolate. We offer caramel fondue and soon peanut butter fondue (another newbie coming soon!!!) so we’ve pretty well covered the fountain products. Now we’re branching off into the “pizzazz” products for your most eye-popping presentations. There is no reason why you couldn’t sprinkle a few Decorettes right on the chocolate fountain table…they’d be beautiful and so original! And truly, a very inexpensive way to jazz up your presentation. Check out all the different colors and shapes on our website. You’ll be able to customize any event, holiday or occasion for your customers. As we roll out more fantastic ways for our Sephra Commercial customers to make money, here’s a sneak peak at our newest, coolest addition to your catering arsenal. Take a look at what’s Up Next. A very dear friend and VERY successful business man in the foodie world made a comment about the newest MONEY MAKING MACHINE available to our Sephra Commercial customers. When we showed him our latest creation he said “Now this is different; this has potential”! So don’t you want a piece of this pie? er um, waffle? You bet!, So, check out our new Zen Waffle Maker! Very, very unique! Our Zen Waffle Maker creates an adorably different waffle on a stick – which will bring customers in droves to your shop, café, fair booth, farmers market, or as an addition to a wedding reception or food eating gathering. Why are they called “Zen Waffles”? Clearly because Zen Waffles take you to your Happy Place! Be one with your waffle! 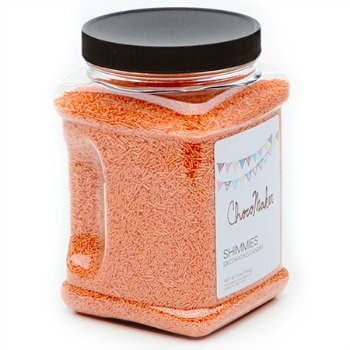 Forecast for summer – sprinkles with a chance of shreds! These awesome waffles bakers are available now but not even in our store yet! We couldn’t wait to get our hands on the first waffle machine and pictured are our creations. We had a blast! 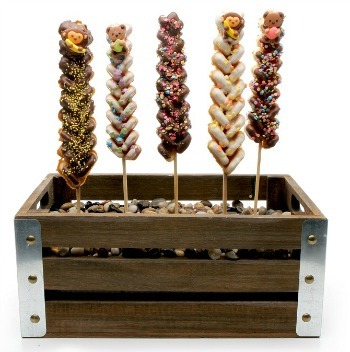 Using the Decorettes, white and milk chocolate, we dressed up the Zen Waffles with glitz, colorful pops of cuteness and even a teddy bear or two to tug at the hearts of little waffle lovers everywhere. Your regulars, tourists and kids of all ages are going to love coming to this waffley happy place! Get a jump on your competition by being the first to add these little money making darlings to your culinary kit. Get a baker today – Give our awesome Customer Care team a call and order one now! 858-675-3088! You will easily pay for your investment in the waffle baker with your first bag of waffle mix. We know you’ve heard this before, but truly, your imagination is the only thing that will limit you as to what adorable creations you can make with these amazing little sugar frills. Go for it! Set yourself apart now! Be the first caterer, café, donut maker, cupcake shop, cake baker or food vendor in your part of the world to create with Decorettes. Buy several now and start creating! We’d love to hear from you. Email, Twitter or Facebook us and let us know how you’ve used the Decorettes. I don’t know about you, but I think any place Zen Waffles are offered – they are going to be a hit! Flying off your cart, bakery counter or as an offering for catered events! They are too cute to pass up. 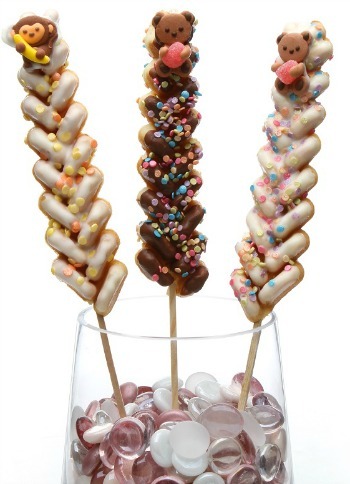 People will want to give you their money for this adorable tasty treat on a stick. Don’t wait! Call us today and you’ll have a Zen Waffle Baker in less than a week. Start making profits right away! If you don’t have a business yet – now is the perfect time to start one. Street fairs are going on every week end across the country. Fall holidays are around the corner. If you make them… people will come!